Peer pressure is the number one influencing factor for those being encouraged to drink alcohol, according to a new survey. The results find that more than 80% of adults in Scotland have been pressured into drinking by friends. 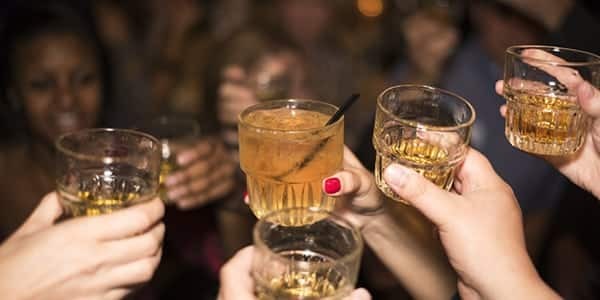 The pilot study of 1697 adults across the UK and Ireland (including 521 in Scotland) found that more people in Scotland than anywhere else in the UK worry they will be ‘left out’ if they do not drink alcohol at a social occasion. The survey was carried out by the One Year No Beer (OYNB) campaign, in collaboration with Stirling University. The campaign co-founder Ruari Fairbairns said that he knows from personal experience how difficult it is to say no when you’re being badgered into having a drink. Adding, it’s easy to cave in under peer pressure when everyone around you appears to be having a great time. “It’s expected of you to drink – it goes against the grain if you don’t. Why is it that it’s the people we call our friends who find it hardest of any of our relationships to accept when we say no?”, said Fairbairns. Nearly 80% of Scottish respondents reported social events as the top trigger for drinking, 4% above the UK average. In Scotland, men were 18% more likely than women to be pressed into drinking by friends, increasing to 20% at social events. A total of 83% of respondents in Scotland said friends had urged them to drink. The most common method of persuasion was the phrase: “Go on, just have the one”. Among teetotallers in the study, around 70% were asked if there was something wrong with them for refusing alcohol. The greatest concern for respondents abstaining from drinking was the fear of appearing boring (at 60% across the UK). However, fear of being left out was greater in Scotland (50%) than the UK average (36%). Researchers found one-third of Scottish men felt vulnerable on the dance floor sober, compared with just 12% across the UK. As reported last month, alcohol-related deaths for adults in Scotland have risen for the fourth year in a row. The figures released by NHS Health Scotland show that in 2016, there were an average of 22 deaths a week due to alcohol misuse – more than two and a half times the number for 1981. The report also highlighted the difference between Scotland and the rest of the UK, with alcohol-specific death rates twice as high in men and 75% higher in women. Sales of vodka were twice as high per adult in Scotland than in England and Wales. Rapid alcohol testing services can now be accessed in Glasgow as AlphaBiolabs opens its first testing clinic in Scotland. There are a number of different types of alcohol tests on offer including breath tests (breathalysers), blood alcohol tests, hair strand tests and bracelets for continuous alcohol detection. Our Customer Services team will be able to recommend the best testing option for your needs, whether a member of public, from the legal profession, or a business looking to enforce workplace alcohol testing. The Walk in Centre is located at Glasgow Medical Rooms, 211 St Vincent Street, Glasgow G2 5QY.